As co-founder, backbone and bassist of Siouxsie and the Banshees, Steven Severin is likely to be forever tied to that band’s astonishing legacy whatever else he does. The presence of his melodic, commanding basslines drove many of the band’s strongest tracks and he’s rightfully regarded as one of post-punk’s foremost bassists. Due to his relatively low media profile, both then and now, it might come as a surprise to learn that he’s been working in soundtracks since at least the late 90s. For a man best known for the structure of his low-end melody, Severin’s work as soundtrack composer still seems like an unlikely avenue for him to explore. Blood Of A Poet, his sixth solo release to date, is a soundtrack to the 1930 Jean Cocteau silent film of the same title and on paper the already busy field of soundtracks for silent movies seems like a curiously well-trodden path to take. While this album is a collection of constructed moods, there’s a definite minimalist monochrome ‘sheen’ to the whole record. Still a beautifully indeterminate work, Severin has put together a series of unconnected moments-in-time tied together by edits and the barest of concerns for any sort of easy or undemanding listen. While Severin has toured with the film, playing alongside it, this standalone audio release is very obviously a different beast altogether. As a string of audio pieces, the record cuts and disappears between styles in synch with the original movie. While it contains reoccurring synth/string motifs like much popular contemporary soundtrack work, Severin has also gone for more of an ambient experimental accompaniment. Gentleness soon gives way to metallic drone, wave-to-shore pulses slashed by razor edits - there’s little slow diffusion from idea to idea. 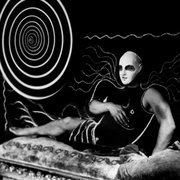 With Severin’s ear and hand forced/directed by the film’s template and Cocteau’s vision, sound is moved through severe changes of temperature and direction. This apparent symbiosis might have appeared stronger if the liners had established more of an observable link between the two pieces, for this is an album that seems to be as much an exercise in creating/presenting cut-ups as it is a companion to the film’s unattached visuals. Severin has created something oddly arctic in Blood Of A Poet, read as a purely audio release this is a gently detached, spacious and sometimes disquieting collection of fractured moments.